The top styles of interior design reflect the mood of the times. This past year saw many exciting design innovations that took old, classic themes and infused them with new life. These are some of the exciting current trends in interior design. In December, Pantone sets an annual precedent with its color of the year, and with 2018’s choice of Ultra Violet, it’s been a year of experimentation, color and thinking outside the box. Now that our palettes have gone organic, it seems our homes must follow as well. Many clients feel a sense of calm in nature, and have requested design to emanate and reflect that calm. Move over navy, and enter sage. Recently shared images to Pinterest show sage booming in popularity, as people adopt it as a ‘new neutral’ color for their bedrooms. The sage green color palette is simply gorgeous. Walls with patterned foliage, botanical print on classic upholstery and natural stone flooring are all part of this lovely decor. Homeowners are opting for reclaimed wood, handcrafted and recycled furniture, pebbles, granite, marble, and those materials that resemble and complement natural elements. We see a lot of refined, natural materials in décor, like sodalite bath accessories. 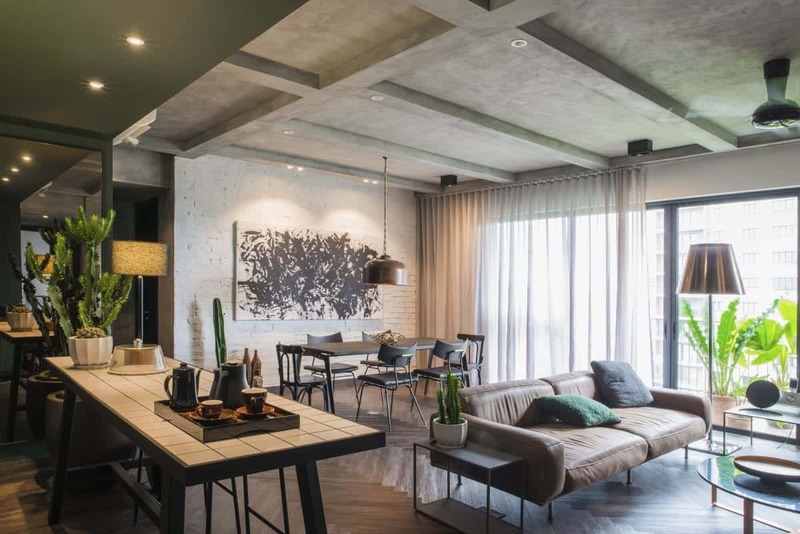 Greenery has been a rising trend for a while now, with more and more people filling their homes with foliage in a bid to counteract our increasingly urban lives. And it’s not just houseplants; it’s also wallpaper prints to fabric patterns, as well as smaller home accessories such as ceramics and tableware. Green upholstery is also set to become a key trend, particularly plush velvet in eye-catching shades of forest green, pine and emerald. Even the normally muted Scandinavian brands have been steadily adding these hues to their collections for 2018. Sleek, dark stylishness paired with metals add a touch of glamour. Black is not a color to dominate an interior scheme – or else the result will make the inhabitants feel as if they are living in space, however when used on accessories, patterns and supporting acts of furniture, the result can make a real statement. Black also adds sparkle and allure. One of the biggest changes taking place in interior design trends is the use of curves and smooth edges instead of the usual boxy edges and clean lines among furniture designs. From soft and puffy chairs to curved coffee tables, these interior design elements are all about comfort and elegance. These shapes often resemble furnishings from previous decades, so it seems like the interior design trends of the 80’s and the 70’s are making a comeback this year as well. Wallpaper, is back, and not your grandmother’s wallpaper. Think tactile natural materials such as rich velvets teaming up with geometric patterned or chintz floral soft furnishings, and larger than life botanical or arty wallpapers. Installing wallpaper is a great way to add an interesting twist to your dull living spaces. This years wallpapers were more decorative and bold than ever before and this interior design trend is certain to replace the use of artwork and other art pieces for wall décor. Some of the most popular wallpaper designs for 2018 featured landscape scenery, abstract shapes, and colorful geometric patterns. So many people write about the Hamptons and style because the Hamptons is style. The nature, the ocean, the beauty, the culture of the Hamptons has created its own brand of iconic Americana. In the Hamptons, trends come and go, but there are three basic styles. There is the old world décor of old money families, reflecting tradition, the love of horse sports, and the classics. Rich Italianate living rooms looking out on romantic gardens. Think mahogany, chintz, oil portraits of the generations, romantic canopy beds, like Jackie Kennedy slept on as a child in East Hampton. Homes by the water often feature large open spaces that let the outdoors in. White on white minimalism is the norm. Modern clean light-stained wooden floors and bright, light colored clean furnishings. Diane Keaton in her iconic white turtlenecks in her fabulous-from-floor-to-ceiling home on the beach is the ultimate in Hamptons style. It is a sophisticated take on country meets seaside. The goal with this interior style is to achieve a balance between the clean and contemporary with the imperfect and rustic for an end result that is elegant, casual, chic and sophisticated. There is an appreciation for organic modernism as well as historical architecture. Think neutrals, jute rugs, buttoned cushions, upholstered headboards, yeah, like the one where Jack and Diane first wound up in bed together! Depending on how involved you are wanting to get, winter and spring are generally the perfect time to start thinking about redecorating for the summer. Obviously, home renovations are much larger projects, while decorating is more superficial and less time-intensive. Designers like Alicia Murphy of Alicia Murphy Design partner with architects and builders to coordinate larger projects. Meg Braff of Meg Braff Designs injects her projects with playful glamour and a modern perspective, adapting to each client’s lifestyle. She locates vintage pieces and uses them in her interiors and as inspiration for her wallpaper and textile designs. Coupled with these objects, her pastel palettes and pattern combinations offer an eclectic take on classic preppy style. Whatever you choose, remember that design reflects mood and evokes feeling. So whether you want to decompress in a zen, neutral sanctuary or be wowed every moment of the day by bold art and design, inspiration is all around to create the world you want to come home to that reflects your personal style.